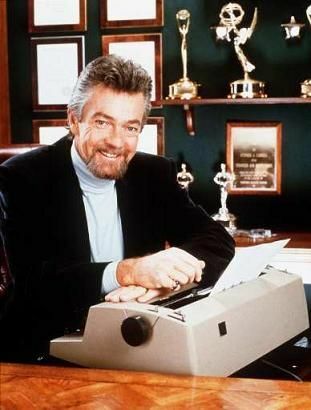 "(Stephen J. Cannell) still gets branded Johnny One-Note (yet has anyone ever noticed any similarity between The Greatest American Hero and Baa Baa Black Sheep except that both involve flying?)." Stephen Joseph Cannell (February 5, 1941  September 30, 2010) was the creator or co-creator of such TV shows as The Rockford Files, The A-Team, The Greatest American Hero, Hardcastle and McCormick, 21 Jump Street, and The Commish. Suffered from dyslexia. Famously appeared in his Vanity Plates on a typewriter and also as the on camera host of Scene Of The Crime and U.S. Customs Classified; he also acted several times, most notably as the Big Bad on Renegade (another series from his company), and was a novelist. The Cameo: Regularly on Castle as himself, and in episodes of his own Tenspeed And Brown Shoe and Silk Stalkings. Compilation Movie: The three-part series opener of City of Angels, "The November Plan," was later edited into a feature film and released to cinemas internationally under that title. Cool Old Guy: Despite the fact that his popular self-titled production logo scared some fans (particularly children), he was known as a really decent and likable guy. Also, when The Simpsons paid homage to his closing logo in the episode. "The Front", he loved it so much, upon meeting showrunner at the time, Mike Reiss, he gave him a hug. Descended Creator: Cannell himself played the evil Lt. Donald Dixon on Renegade. Follow the Leader: The Last Precinct, Cannell's only Sitcom (created with regular collaborator Frank Lupo), was clearly patterned after Police Academy (in the pilot a character even says "How [the cops] got out of the police academy I'll never know"). What Could Have Been: 1980's Nightside was a pilot for a never-made series which was created by Cannell and Glen A. Larson. Stephen J. Cannell and Glen A. Larson - it would have been a 1980s TV dream come true. In 1997 CBS asked him to oversee a revival of Hawaii Five-O, but it didn't turn out too well (among other things, he brought back Chin Ho — who had been Killed Off for Real). Said pilot has never been made available to the public in any form to this day, and with the successful new version almost certainly will never be screened in the future.